James Prosek. Yellowstone Composition No. 2, 2016. Mixed media on wood panel, 45 x 45 in. 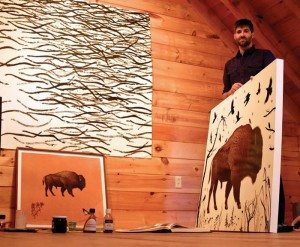 The special exhibition Yellowstone: Wilderness in a Box, showcases the work of internationally-renowned artist James Prosek. 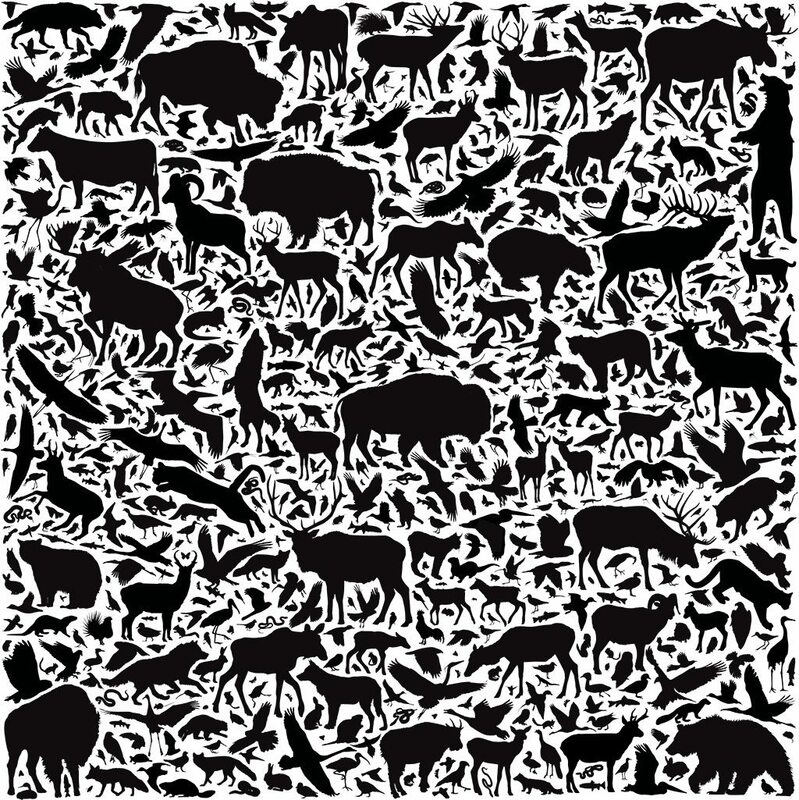 A major contributor to the Center’s 2016 exhibition Invisible Boundaries: Exploring Yellowstone’s Great Animal Migrations, Prosek’s pieces from that exhibition, regrouped and reinterpreted, now appear in a stand-alone exhibition. On display in the Center’s Cody Firearms Museum Breezeway, it is on view through June 4, 2017. Unless otherwise noted, all artwork is courtesy of the artist and SCHWARTZ • WAJAHAT, NEW YORK. James Prosek reminds us that a whole constellation of migratory creatures experience unseen journeys, linking Yellowstone not only to nearby ranches but faraway oceans and foreign countries. Yellowstone National Park’s nearly rectangular boundary was originally drawn to encompass geological and scenic wonders. The region’s biological wonders—especially its unique animals—are more difficult to confine. Some insects, birds, and mammals that call Yellowstone home for part of the year regularly migrate well beyond the park’s perimeter. 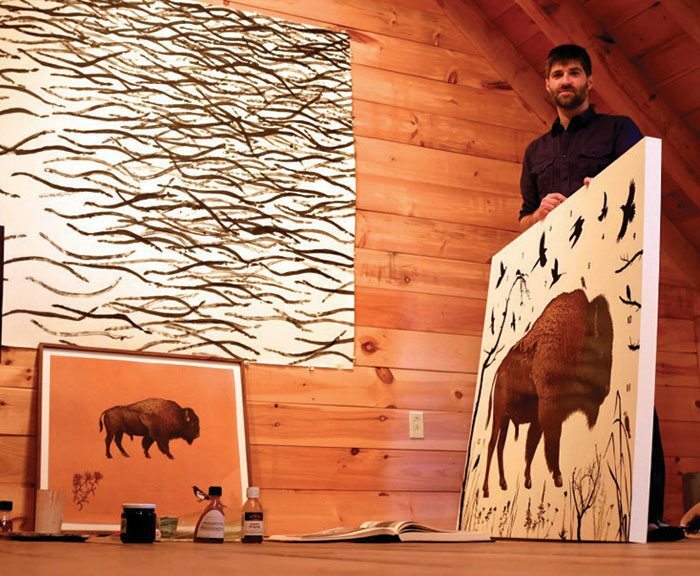 Artist and writer James Prosek tackles Yellowstone, its wildlife, and its man-made boundaries in a recent body of work. For the paintings and field sketches presented in Yellowstone: Wilderness in a Box, Prosek studied Yellowstone’s flora and fauna, paying special attention to elk and other animals that make long-distance migrations. Prosek’s artwork calls into question our human desire to draw lines on the natural world. We create boundary lines on maps, and we name and categorize plants, animals, and minerals. In doing so, we attempt to create order from complexity and interconnectivity. Through his artwork, Prosek suggests that trying to contain nature—within park boundaries or by a name—denies the natural world’s hybridity and fluidity. 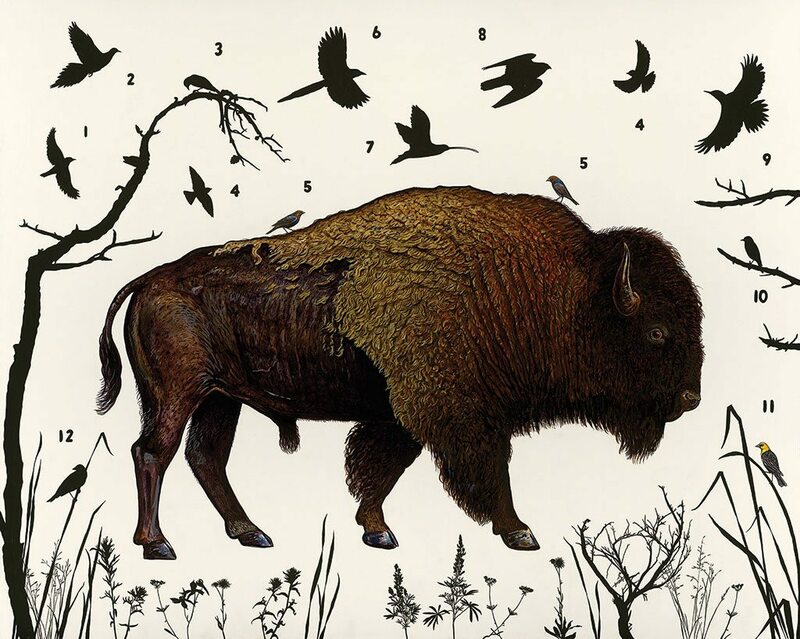 Prosek’s “American Bison (Wyoming),” 2014. Oil, acrylic, and mixed media on wood panel. Art Scanning: Donald Sigovich, Westport, Connecticut. Audubon (1785–1851) is best known for his exquisite and detailed depictions of wildlife, especially the birds of North America. He had a lifelong curiosity about the natural world and an astonishing talent for drawing. 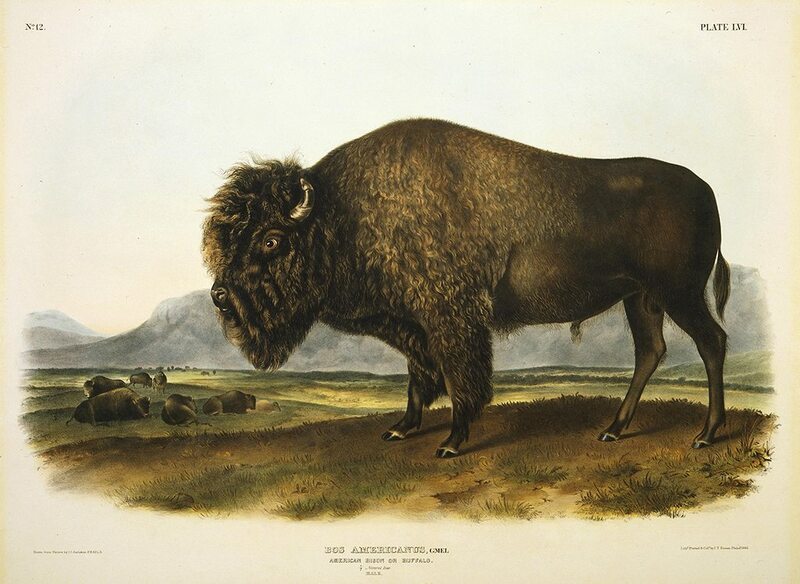 He traveled extensively to study his wildlife subjects, and sketched from live and harvested specimens. Audubon’s large-format images of birds and mammals collected in portfolios were wildly popular following their publication, and remain so today. Prosek’s painting style and subject matter might resemble the work of the historical artist-naturalists like Audubon, but his message is more provocative. Although Prosek uses traditional painting techniques, he tackles contemporary issues. He carefully arranges his plant and animal subjects to explore the hierarchies and boundaries that humans create between things in nature. 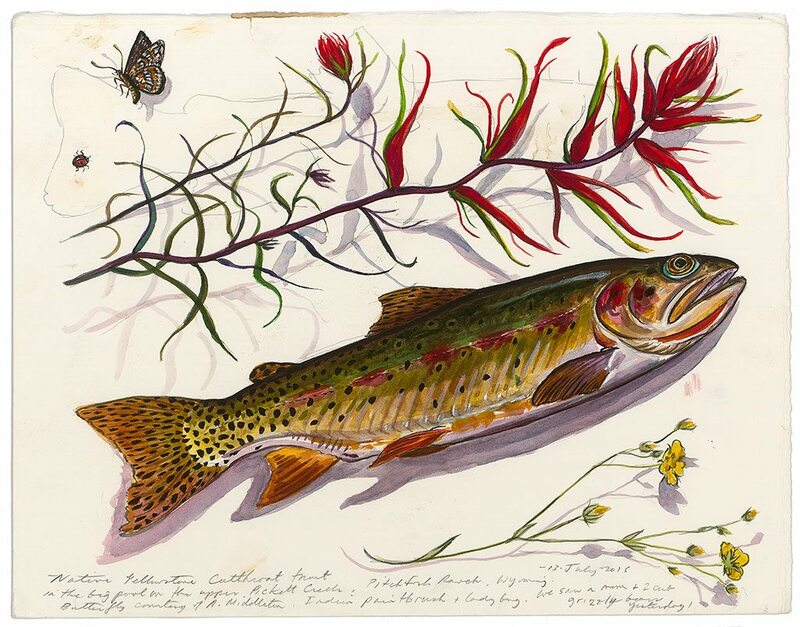 Prosek’s “Yellowstone Cutthroat Trout and Indian Paintbrush, 2015. Watercolor, graphite, and gouache on paper. Art Scanning: Donald Sigovich, Westport, Connecticut. At times, Yellowstone can appear like a wilderness in a box, but then again, when you’re out on the land itself, filled with the scent of sage, the visual feast of a wildflower meadow, a trout holding in a thread of current, it is not in a box at all. Artists have long painted en plein air (in the open air) in order to depict their subjects with realism and immediacy. In the nineteenth century, Audubon famously worked outdoors to observe and sketch birds and other wildlife in their natural habitats. Prosek’s artistic process is fundamentally informed by close, attentive observations of nature. His desire to study his subjects in person has taken him on journeys to remote and sometimes dangerous places across the globe and, for field sketch paintings in this exhibition, including the two shown here, to the Yellowstone backcountry. Prosek draws on the traditional practices and aesthetic of artist-naturalists; he relies on in-person observation of flora and fauna, and carefully renders his subjects with striking realism. Prosek’s “On Carter Mountain above Pitchfork Ranch,” 2015. Watercolor, graphite, and gouache on paper. Art Scanning: Donald Sigovich, Westport, Connecticut.